Gemma is a distinguished pianist with extensive experience in the classical and musical theatre fields, as well as being a busy accompanist. 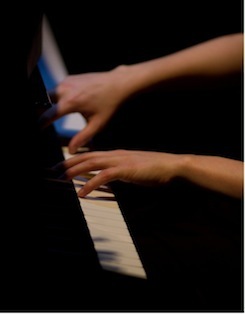 Her work ranges from weddings and dinner music to chamber ensemble and orchestral keyboard parts. She trained as a pianist at the Junior Guildhall School of Music and Drama with Sanae Nakajima before continuing her studies at the full-time school with Laura Roberts and Pamela Lidiard. Gemma achieved great success in music festivals across Essex, notably winning the Millennium Cup among other recital classes at the Stratford and East London Music Festival and representing Havering at Rotary competitions. Performance highlights include a recital at the Millennium Centre in Cardiff; John Adam’s chamber symphony and Leonard Bernstein’s Prelude, Fugue and Riffs in the Barbican Centre, London. She is in demand as an accompanist, working for many schools and music centres across London and Essex as a pianist for exam sessions. Gemma also regularly accompanies candidates at music festivals, as well as playing for recitals and recordings.